The next room has nothing of value. On the third step from the top of the stairs, on the left-hand side, is a pressure plate that activates a battering ram from behind you. Through the locked grated door is a small naturally lit room with vegetation growing in the center including a blue mountain flower and roots hanging down from the ceiling all around the room. There is an executioner's block with an iron battleaxe driven into it and two hanging moss hanging down. Continuing through the next tunnel you will come upon the Lowlife who is facing away from you (and, apparently, if he/she notices you early enough, grabs that iron battle axe, deals with skeever in the very room and rush towards you even before you've jumped beneth raised bridge) and on the table a copy of the Pickpocket skill book Beggar, a loaf of bread, a salt pile and a drum. There are two tunnels to the north, the left-hand tunnel leads to the raised bridge seen previously from the other side and the associated lever. The right-hand one leads to the expert-locked grated door as seen previously. The door to the east leads to the Ragged Flagon. During the A Cornered Rat quest Shavari will be seen around town and waiting for you as soon as you enter The Ratway. Following the path around the pillar and the next corner, there are two alcoves to the left. The second alcove has no floor and an oil lantern that can be knocked down onto an oil slick on the floor of the level below. The tunnel then turns west and at the end turns north and leads out into the first room, on the next level down. There is a Vagrant patrolling along the path. Completing the circle and continuing under the entrance. The passage continues into a room in darkness. In the room is an anvil, a workbench with a pair of random enchanted gauntlets, three iron ingots and a leather strip on top, and an unlocked chest in the dirt behind the anvil. There is a lit tunnel heading west, opposite the workbench with an iron helmet on the ground. The room after this is guarded by another Vagrant who uses a bow at the top of two flights of stairs and a Lowlife by a table at the bottom. The room contains a long wooden table and chairs in the middle of the room with a random enchanted war axe, three small coin purses and one large, six loose septims, a loaf of bread and two chests, both containing minor loot; one unlocked and the other apprentice-locked. Under the stairs, against the north wall are two sets of shelves holding a woodcutter's axe among a lot of clutter and a novice-locked chest to the right. Above this, painted on the wall is the "Loot" shadowmark. The chest contains Dravin's bow among its loot, a unique bow stolen from Dravin Llanith, the owner of Merryfair Farm just outside Riften to the north. He and his wife were recently robbed, speaking to him will initiate a quest to recover the bow from thieves in The Ratway. A short tunnel leads south from here, to an overgrown corner section of the tunnel that contains a skeever. The tunnel eventually opens up to the first room again, this time on the bottom floor. There is an open gate opposite and barred windows along the east wall. On the ground is a pickaxe, while against the north wall is a straw bale with a couple of food sacks beside it. Beyond the open gate appears to have a small oil slick with the oil lantern seen in the tunnel above, over it. 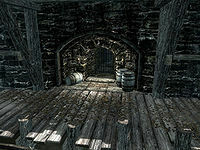 Against the south wall, behind more bars is a random Illusion potion on the ground and to the left is a short tunnel leading down a some stairs to a door that opens into The Ratway Warrens. Esta página foi modificada pela última vez à(s) 00h30min de 28 de janeiro de 2016.